Sony Pictures has released a domestic trailer for Rian Johnson’s “Looper.” The film opens in theaters on Sept. 28 and stars Bruce Willis, Joseph Gordon-Levitt, Emily Blunt, Paul Dano, Noah Segan, Piper Perabo and Jeff Daniels. Thirty years down the line, time travel is invented, but it’s illegal and only available on the black market. When the mob wants to get rid of someone, they will send their target 30 years into the past — our present — where a hired gun or a “looper” such as Joseph Gordon-Levitt’s Joe is waiting to clean up. Life is good for Joe until the day the mob decides to close the loop and he is face to face with his future self played by Bruce Willis, and he has to decide whether to break the only rule that loopers have: Don’t let the target escape. 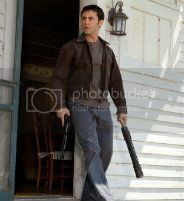 What are your thoughts on the domestic trailer for “Looper”? Tell us your thoughts in the comments section to the right.